1994 Topps is sort of a forgotten set that is actually not too bad. I have always wanted to incorporate the home plate shape into a card some how and this set sort of did it. The picture comes to a point at the bottom that makes it look a little like home plate. I like the script font as well. The problem with script fonts is that they can be difficult to read. This font is no exception. It is not matched exact but thanks to fellow custom card-er Harvey Berkman, I was able to get pretty darn close. This font is Vladamir Script and is close enough if you are trying to re-create this set. The rest of the card is a lot of unnecessary flash; many gradients that don’t add dimension, they just add color. Now to the picture. I have wanted to do this picture for a while. If you have been to a Royals game and got the pleasure to watch Joakim Soria enter a game you know why the picture is cool. Kauffman Stadium blasts “Welcome to the Jungle” by Guns N Roses and all the scoreboards around the stadium show flames. The crowd naturally gets into the moment and it creates a very cool environment not seen too often for a team consistently low in the standings. The picture is not the best, normally the pictures I choose are a little cleaner than this one but it was all I could find. If you click on it you can see the pixelization but I had to use it anyway. The set fits well with the picture too. 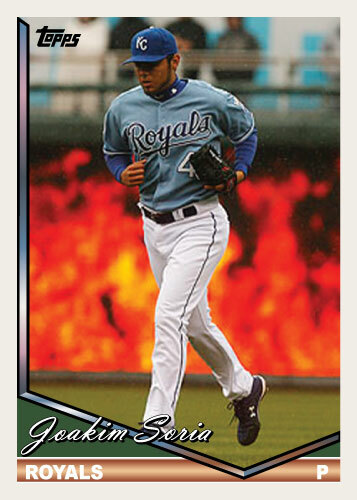 When I started the “History of Joakim Soria” project, this is the kind of card I had in mind. Thanks, I got your link active now, earlier I couldn’t get to your account or I would have linked it sooner. Thanks again for the help on this card, I still think your Tim Collins looks better.